The Wizarding World takes a darker turn with The Crimes of Grindelwald. And in the US, it also took a darker turn with critics and at the box office. Returning to provide some musical continuity is James Newton Howard. He continues musical ideas from Fantastic Beasts and Where to Find Them (2016) to highlight big moments, but are used sparingly. For this film, he introduces themes for Leta, Dumbledore, Nagini and the big bad, Grindelwald. Darker material mixes with the large action opening of The Thestral Chase. In this track, we hear the obligatory Hedwig's theme, a choral memory motif, and first statements of Grindelwald's theme before ending with the Fantastic Beasts fanfare. Newt and Leta is a playful and tender cue, while Dumbledore features some magical signatures and also introduces Dumbledore's flighty theme. More of the magical sounds are present in The Kelpie, which lets Howard's majestic writing shine. Newt and Jacob Pack for Paris is a lighthearted cue, featuring choir, Parisian flavor and a return of Jacob's theme and the Fantastic Beasts theme. Nagini introduces her mysterious theme which stays in the lower end of the orchestra. The friendship theme returns along with a twisting circus reprise of the Fantastic Beasts theme. We get more magical creature underscore at the beginning of Newt Tracks Tina before it changes moods to a full statement of the friendship theme. Queenie Searches for Jacob underscores Queenie's emotional scene complimented nicely with choir. Irma and the Obscurus starts with a longing string section before it crashes into a booming section for chanting choir and orchestral dissonance. Blood Pact combines aspects of both Grindelwald and Dumbledore's theme and the memory motif. Newt's heroic theme finally appears in Capturing the Zouwu, with another reference to the friendship theme. The Fantastic Beasts theme is arranged in the magical Williams style of swirling strings and celeste in Traveling to Hogwarts. If I recall correctly, this moment in the film is replaced with a tracked version of Hedwig's theme. Leta's theme gets a proper expansion in Leta's Flashback, heavily featuring harp and chorus and an extended emotional piano solo. Salamander Eyes features the friendship theme with strings and piano solo, one of the score's stronger cues. Matagots is a really fun action track, with swashbuckling brass shining through as Newt's heroic theme bursts through the dissonance. Your Story is Our Story is mostly ominously quiet underscore, with Grindelwald's theme lurking in the low strings. Leta's Confession carries much of the dramatic weight of the scene, using a slower reprise of the Fantastic Beasts theme, while Leta's theme naturally carries much of the track. Vision of War features a dark and string section, dissonant choir and otherworldly sounding orchestral and percussion techniques. Spread the Word builds through most of the dramatic cue with choir and a string ostinato as we follow the decisions of several main characters. Wands into the Earth starts with the memory motif and eventually builds to some great brass interplay, large choir and a grand statement of the Fantastic Beasts theme. Restoring Your Name returns to the more somber underscoring which uses several past themes. We hear Dumbledore's theme and Fantastic Beasts theme before turning to darker side with Obscurus and Grindelwald while building to an explosive orchestral ending. Fantastic Beasts: The Crimes of Grindelwald is the lively beginning of the end credits, featuring much of the music from the trip to Paris and a bold statement of Newt's heroic theme. The album also includes three piano solo arrangements of major themes: Dumbledore's Theme, Fantastic Beasts Theme and Leta's Theme. These aren't included in the film, but a nice way to appreciate the material written for the film. In general, I find this score (and film) lacking something. Much of the magical atmosphere from the first film has been dropped in favor of Grindelwald's ominous takeover. Much of the film's problems seem to come from the writing and direction, in my opinion. While not always displaying a magical sparkle, James Newton Howard's score carries much of the emotional weight. The lack of dialogue in the extended flashbacks and finale give plenty of times to highlight the score. The use of past themes seem more like cameos than integrated into the film itself. I'm glad the Fantastic Beasts theme is used, but with Newt, Tina and Jacob basically sidelined through the film, much of their respective material isn't touched. In addition, the newer themes are fine even if they don't make much impact outside their scenes. 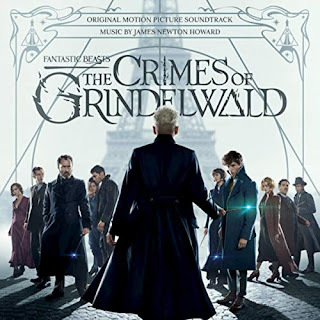 Grindelwald and Dumbledore's themes didn't make much of an impression in the film (or much in the album), but Howard can expand on that in the future films. The score is still worth a listen. Howard matched the darker tone of the film, but without the fantastical elements, the score just doesn't pop like the last.